Using a night splint is an effective treatment for alleviating plantar fasciitis. Studies have shown that using a night splint over a period of a month. In one such study, eighty percent of the involved feet improved subjectively. The Exoform Dorsal Night Splint, shown below, is a new solution that addresses the common problems associated with typical dorsal night splint models, including lack of adjustability, uncomfortable or painful pressure points, and product migration and rotation that diminish product effectiveness and compliance. The smaller, lighter design of the Airform Night Splint, shown below, provides greater ease of use during the night in bed. The dorsal night foot splint treats the problem differently than braces or supports by applying a mild passive stretch to the achilles tendon and plantar fascia to keep it in a lengthened state. This static positioning (rehabilitation) allows the soft tissue a chance to heal thereby reducing pain and discomfort when walking. This plantar fascitis night splint maintains the ankle in a neutral position (ankle at a right angle) to impart a gentle, constant stretch to the achilles and plantar fascia on the bottom of the foot. 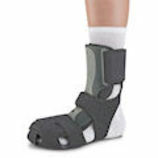 The Orthotic Shop provides quality night splints at affordable prices. We strive to keep you on your feet as the feet are the foundation of the body.